If you are health conscious and control your diet in a precise manner and also use latest technology to help you in it. Then here are some latest gadgets for you. 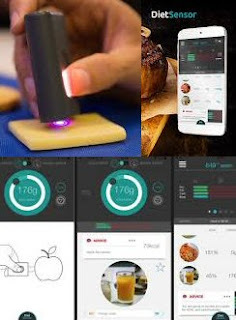 DietSensor: This Gadget scans the food and tell its nutritional value. It able to predict the details by using a infrared light wave which is projected into food item and the molecules of food item start to vibrate. Every food item have a different optical signature and thus the DietSensor predicts the nutritional value. This gadget can be connected with a app on your smartphone to help you in your dieting goals. Diet Sensor is available for $249 by a company named ConsumerPhysics. There only one drawback of this device. It can only scan single layer food items. It means it can't scan a burger, but it can scan a piece of bread and slices of potato. I am not sure how many people people will by it but a number of dietitians will definitely buy it. It can also help the patients of Diabetes and High Blood Pressure. HidrateSpark: If you use to forget drinking water there then here is a smart bottle for you which will remind you after certain time limit to drink the water. 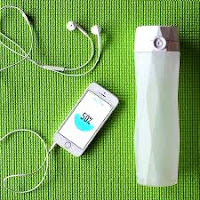 This bottle works in coordination with an app on your smartphone and take care of your age, weight and health condition in deciding the correct water drinking goal. This app also access data from fitness tracker or pedometer (if you wear any) and tells you to drink water accordingly. There is a tube inside this water bottle and it starts glowing which its time to drink water. HydrateSpark comes at a price of $60. This is an economical solution for those who frequently suffer from UTI. If you are hydrated then chances of such infection decreases. 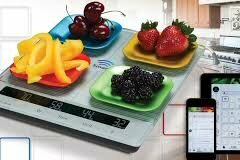 Smart Diet Scale: Its another gadget for dieting freaks. This is a weighing scale and it can measure weight of 4 different food items at once and helps you in measuring the nutritional value of your diet. It contains nutrition information of 400,000 different food items. It can also scan the food using the bar code present on its packing. This Smart Diet Scale is available in $150. Apart from the above information its also a good looking gadget for your dining table. Modern Engineering is helping in maintaining our health and keeping track of our medical condition. Dieting is never given so much importance until now. Now engineers and healthcare industry has taken dieting to one step further. Today's dieting is not abstaining from eating but having a balanced diet and these gadgets can definitely help you in achieving you dieting goal.